Whether it was the jaw-dropping dunks that brought fans out of their seats, or yet another stat line that hadn’t been generated by an NBA player in decades, witnessing Anthony Davis’ exploits in person for every game of the 2014-15 season was a memorable experience. Invariably, after one of Davis’ remarkable individual performances, a writer covering the opposing team would sidle up to me and say something along the lines of, “Wow, what Davis did out there tonight was absolutely incredible... But this must be normal for you, right? Because you get to see this every night!" Indeed. The fascinating aspect of his rapid rise is that as Davis heads into his fourth season, he still has upside. Fans should appreciate what he already is, though, a uniquely talented player who has become must-see TV. Trust me, as someone who’s been in the building for every one of his Pelicans-era games, you’re going to want to tune in next season, to see what happens next. On any given night, there’s a chance you may witness something you’ve never seen. A whistle blows, marking the end of a USA Basketball minicamp practice in Las Vegas. As Davis and the greatest collection of young basketball talent I’ve ever seen disperses to various corners of the gym on a steamy July day, it’s time for NBA writers like me to devise a plan of attack. But here’s the best part: No matter what strategy I choose, I can’t lose. Looking for the reigning 2013-14 Most Valuable Player’s perspective? There’s Kevin Durant. Need to talk with the man many are calling the greatest shooter of all time? Stephen Curry’s here. The youngest league MVP ever? Derrick Rose is nearby. Although the interview options are virtually limitless, if there’s one player I absolutely must speak to, it’s Durant. Two months earlier, after winning the MVP trophy, Durant delivered a touching speech and shortly thereafter texted Davis to tell the then-21-year-old that it wouldn’t be long before Davis too was a league MVP. Durant’s prediction and encouragement to Davis simply begged for further comment. So as a contingent of only a few dozen media members scramble to talk to USA players and coaches, I sidle up to Durant with a simple question: What motivated you to send that encouraging message to Davis? “I know how good he’s going to be,” Durant said. “I know how good he is now, but I know how good he’s going to be. He’s an MVP-caliber player. So he’s next. He’s next in line – a guy that has grown so much in just a year. I’m excited to see what he does from here.” As Davis demonstrated repeatedly on the court over the ensuing nine months, Durant’s level of excitement was very justified. 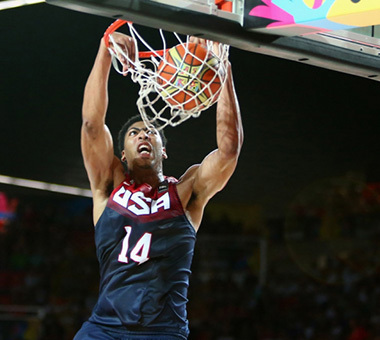 Anthony Davis skies for the block in the #USABMNT Showcase on ESPN! 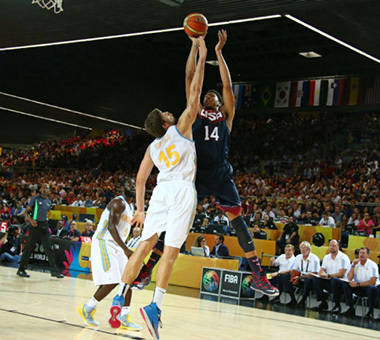 @antdavis_23 skies for the block in the #USABMNT Showcase on @espn! D avis’ 2014-15 rise to the top of conversation across the sport began in earnest halfway across the globe, in Spain. Unless you were lucky enough to catch one of his mere three total national TV appearances over his first two NBA seasons, the August/September FIBA World Cup may have been your first opportunity to see Davis since his ’11-12 championship season at Kentucky. If you’re like virtually everyone who watched Davis dominate en route to Team USA rolling to a gold medal in Madrid, it was an eye-opening experience. 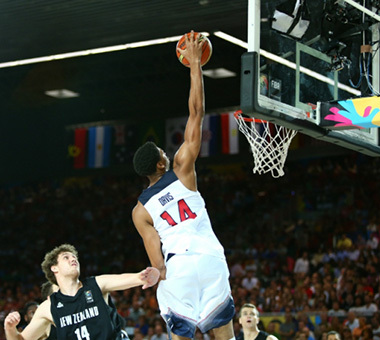 Davis led USA Basketball in blocks and was second in rebounding and efficiency rating. 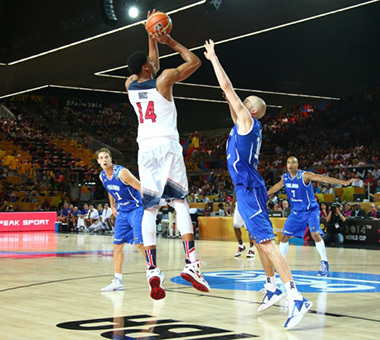 After pacing the Americans in point production for much of the FIBA tournament, he settled in as their No. 4 scorer. 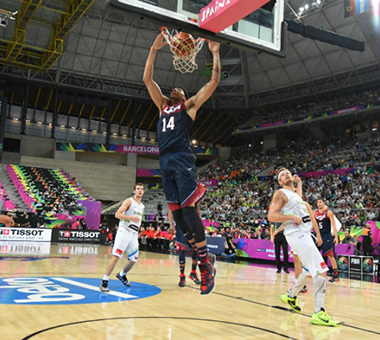 Two years after a teenage Davis served as USA Basketball’s 12th man during the London Olympics, he was elevated to a drastically different role, described as the team’s MVP for portions of the World Cup. “Anthony Davis exploded into the league’s elite tier in just his second NBA season and has been the best player on Team USA this summer,” ESPN.com’s Bradford Doolittle noted. 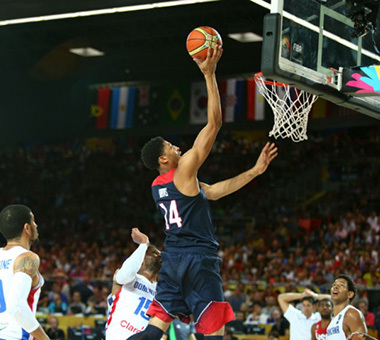 “Anthony Davis, now on the world stage, is the next superstar,” declared the New York Times. 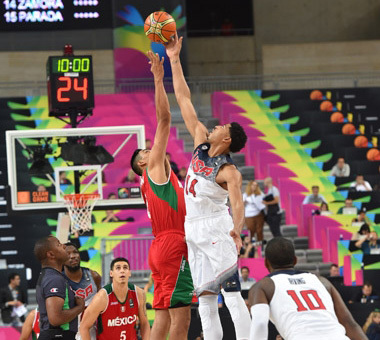 As has been the case since Day 1 of his career, instead of focusing on his individual accolades, Davis preferred to shift the conversation to Team USA’s success. With Davis at the forefront, the national team has regained supremacy atop the sport, after faltering in the early 2000s. No different than a regular game. @antdavis_23 with the Open Practice throwdown! T hat work officially began on the last Tuesday evening of October, as the NBA regular season opened with a slate of three games, all hosted by Western Conference cities. At the water cooler Wednesday morning, the performance many fans raved about came from the one game that was not broadcast nationally. As San Antonio raises a fifth NBA championship banner in Texas and Lakers legend Kobe Bryant makes his anticipated return from a knee injury in California, Davis delivers a bold statement in Louisiana. In Game 1 of his third NBA season, the 21-year-old was seemingly everywhere, racking up 26 points, 17 rebounds and a career-high nine blocks in a 101-84 home victory over Orlando. He became the first NBA player since the 1985-86 season to generate a 26-17-9 statistical line in a team’s season opener. He’s also the first player since Dwight Howard (30-19-10 in 2008) to produce those numbers in any game. The national reaction was widespread. “Anthony Davis is going to be incredible to watch in his third season,” SB Nation succinctly put it. “Be very afraid: Anthony Davis seems poised to become even more dominant than we all had anticipated,” SLAM warned the next day. Individual dominance is one thing, but nothing pushes an NBA player to a new level of respect and recognition like winning does. Despite the presence of Davis, New Orleans had gone a combined 0-8 vs. division rival San Antonio over his first two NBA seasons. The Pelicans hadn’t prevailed on the Spurs’ home floor in their previous seven tries, dating back to Oct. 30, 2010. So when Davis drove past Aron Baynes for a game-deciding layup with 6.6 seconds left in a 100-99 thriller Nov. 8, it was an early sign of things to come for a franchise trying to join its Southwest Division brethren among the NBA’s elite. That’s true – three other Pelicans starters scored 14 or more points – but with the game on the line, Davis used his skill and athleticism to get to the rim for the final two of his 27 points (he also notched 11 rebounds and six blocks). The win and clutch basket proved to be a bit of foreshadowing: New Orleans finished 3-1 vs. San Antonio during the regular season, including the Game 82 victory that got the Pelicans into the NBA playoffs. PORTLAND – NBA players are too big, too athletic and too skilled to have their shots beyond a few feet from the rim blocked, no matter how formidable the defender. Of the roughly 10 blocks in an average NBA game, the vast majority come on layups, dunks or floaters in the paint. That’s what made Davis’ feat in Oregon so supernatural. At the 1:38 mark of the second quarter, Davis swatted Portland All-Star forward LaMarcus Aldridge, he of the normally unblockable, high-release jumper. One second later, Davis rejected guard Wesley Matthews’ 19-foot shot. Two blocks in two seconds? No wonder Davis led the NBA in rejections for a second straight season, with 200 swats, averaging 2.9 a game. He also became New Orleans’ all-time career leader in blocks, with 501 in just 199 total games. Anthony Davis scores a career-high 43 points (on 16-23 shooting) and grabs 14 huge rebounds to propel the Pelicans over the Jazz 106-94. Well this was our favorite play from the first half...https://t.co/BqcSuCPftd - what was yours? AD goes for 29, 13 and 2 vs. Atlanta to help end the Hawks’ 19-game win streak. D avis wasn’t done delivering game-deciding hoops for the Pelicans on the road in ’14-15. He tallied the final two points of a 101-99 victory Dec. 21 at Oklahoma City, then in improbable fashion, beat the Thunder at the buzzer Feb. 6, again in Chesapeake Energy Arena. Davis excels in perhaps as many different aspects of the game as any NBA player, but three-point shooting is not one of those categories. A glance at his ‘14-15 statistics indicates that he shot just 1-for-14 from beyond the arc. Yet the one three-pointer he did make was hands-down the single most memorable play from the Pelicans’ season. Tied at 113 against the Thunder with 1.2 seconds left, New Orleans drew up an inbounds play that was designed to be a lob pass to Davis at the rim, but after Oklahoma City thwarted Davis’ attempt to cut to the hoop, he improvised and circled back to beyond the top of the key. Inbounding from the left side, Tyreke Evans hit Davis just before what might’ve been a five-second violation; Davis double-pumped in the air and had to squeeze off a leaning 28-foot shot between leaping OKC defenders Kevin Durant and Andre Roberson, connecting for a 116-113 win. In can-you-believe-that fashion, the Pelicans secured what may have been their biggest victory of 2014-15 (they finished tied for eighth in the West with OKC, but made the playoffs based on a 3-1 head-to-head tiebreaker). Davis was mobbed at the other end of the court by celebrating teammates, who rejoiced in the moment. New Orleans moved two games ahead of OKC in the standings, behind Davis’ 41-point performance, at the time his second-highest scoring game in the NBA. W ith highlights like that, along with frequent individual games good enough to be placed in the “historic” category, AD’s popularity soared. A year after he received 286,247 All-Star votes from fans in 2014 (eighth among Western Conference frontcourt players), his rapidly-expanding legion of supporters more than quadrupled that number, casting 1.3 million ballots for him. Davis jumped all the way to No. 1 on the list of West frontcourt players, while finishing third overall. The only NBA stars to garner more votes were eventual league MVP Curry (1.5 million) and LeBron James (1.4 million). In addition to being cheered when his name was announced in otherwise inhospitable road venues, there was a considerable uptick in the number of Pelicans No. 23 jerseys sported by fans outside the Crescent City. Davis’ drastic jump in recognition was also noticeable when New Orleans checked into a hotel on the road: During Davis’ first two NBA seasons, a large percentage of his autograph-seeking fans wore University of Kentucky gear and thanked him for what he did for the Wildcats during his 2011-12 NCAA title season. This winter, most sported Pelicans paraphernalia, or carried items for Davis to sign that depicted him rising for a dunk or a blocked shot in his New Orleans uniform. His reward for topping all West frontcourt players was a starting role in the 2015 All-Star Game, but there was one problem: on Feb. 7 vs. Chicago, Davis was injured on a hard fall to the floor, spraining his right shoulder. While many media members and fans second-guessed New York forward Carmelo Anthony’s decision to play in the Feb. 15 All-Star Game – but then shut himself down for the season immediately thereafter due to injury – Davis essentially did the opposite: He sat out All-Star so he’d be able to help New Orleans in its playoff push. Sports Illustrated writer Lee Jenkins – who profiled Davis for the magazine’s Dec. 8 cover story – was a guest on the Jan. 23 Black & Blue Report (19:40). Jenkins described Davis as a player who’s breaking the mold of what’s expected, in a variety of ways. “He’s reaching this rare status for a big man,” Jenkins said on the show. “When you talk about the most popular players in the league, it’s usually guards or wings. That’s reflected in some of the shoe deals and off-court endorsements, but it feels like Anthony’s kind of crossing over, where everyone knows who he is. Fans who don’t normally gravitate toward big men, kind of see him differently. Maybe that’s because of the way he plays – the athleticism he has… He’s thought of as an all-around, athletic marvel, and not just your typical big post player. Anthony Davis was again a runner-up for the season-long award in 2014-15 (Russell Westbrook earned the top honor), but that wasn’t due to a lack of effort. Davis, who at 22 isn’t significantly older than some of the New Orleans youngsters who benefit, launched his brand-new “Flight Academy” program in November. Over the course of the rest of the season, he hosted numerous monthly community events in the New Orleans area. Your January @nbacares Community Assist award winner...Mr. @antdavis_23! Green is good, right? RT @nbastats: @AntDavis23 was locked in! Ties his career-high w/ 43 as he shoots 17-of-23. Flirting w/ a quad-double last night, Anthony Davis' 36-14-9-7 game is the first of its kind since blocks were first recorded in 1973-74. Anthony Davis was named Western Conference Player of the Week, compiling a team 2-1 record, 31.3 points, 10.0 rebounds, six assists and a league-leading 4.7 blocks. Anthony Davis' Western Conference Player of the Week stat line: 31.3 ppg (2nd in #NBA), 10.0 rpg, 6.0 apg, 4.7 bpg (1st in #NBA). Flanked at his Smoothie King Center locker on all sides by media members following Pelicans shootaround, Davis calmly downplayed the circumstances, insisting he wasn’t treating the San Antonio matchup any differently. Roughly eight hours later, Davis delivered on that promise, in a playoff-clinching 108-103 victory over the defending NBA champs, who were riding an 11-game winning streak. For the 15th time during the 2014-15 regular season, Davis registered a 30-10 performance, posting 31 points, 13 rebounds, three blocks and two steals. Davis and his teammates were overjoyed afterward for a range of reasons, including that they somehow managed to overcome a four-game deficit to edge Oklahoma City for the No. 8 seed in the West. Through 71 games, the Pelicans were 37-34, while the Thunder were 41-30, but over the final three weeks of the season, New Orleans went 8-3, coinciding with OKC’s 4-7 close. P atience is a virtue in the NBA, where team success doesn’t always happen immediately, or as quickly as even the game’s greatest players believe it should occur. For example, among the two biggest stars who competed in the 2015 NBA Finals, Curry didn’t reach the playoffs until his fourth NBA season; James waited until his third year to break through. As did 2013-14 MVP Durant. Like James and Durant, Davis’ first chance to perform in the pressure cooker of the NBA postseason took place after two non-playoff years. But when Davis received his opportunity to show what he could do on the biggest stage so far for him as a pro, he exceeded even his elite production from the regular season. Though the Pelicans were swept 4-0 in the first round by the eventual NBA champion Warriors, Davis still managed to join another prestigious list. By averaging 31.5 points and 11.0 rebounds, he became just the fourth player in NBA history to go for 30-10 in his first four career playoff games. The other members of that exclusive company are Kareem Abdul-Jabbar, Wilt Chamberlain and Bob McAdoo (a trio that combined to win the NBA’s MVP award a combined 11 times, led by Abdul-Jabbar’s all-time record of six). As is his custom, Davis didn’t want to talk about those stats afterward, instead assessing what he and the Pelicans may have learned from their first playoff trip. Although New Orleans played Golden State competitively, with a chance to prevail in the final minutes of Games 1-3, they weren’t ready to overtake a 67-win opponent. “It’s always an honor to be in that category with those guys,” Davis said. “But at the same time, my focus isn’t about getting in the record books or stats or anything like that. In this series, the focus was on winning, and in this (Game 4), winning one game. And I wasn’t able to do it. So (the 30-10 stat) doesn’t mean anything right now. We got swept, and that’s a tough pill to swallow. More of this in Game 2...sounds good to us! T The spring brought a slew of new additions to Davis’ already loaded basketball resume. After not appearing on any of the three All-NBA teams previously, he earned a spot on the All-NBA first team. He ranked fourth in Defensive Player of the Year voting. Made All-Defense second team. Was runner-up for the NBA’s annual Community Assist award. Finished fifth in MVP voting, while placing sixth in Most Improved Player voting (incredibly, it was the second year in a row Davis emerged as a legitimate MIP candidate). For years to come, he figures to be a perennial MVP candidate, but for chunks of ’14-15, particularly during his fantastic start, he seemed like he might win it in only his third NBA season. For example, in November, the Washington Post declared “Anthony Davis leads NBA’s MVP race.” NBA.com listed him as the early frontrunner for the award all month. Ultimately he was deemed the fourth or fifth candidate on most lists and took fifth in the official vote, which was announced May 4. In April, Davis said he would’ve chosen James Harden if he had a vote, explaining that he was honored simply to be cited among the MVP contenders. From Las Vegas to Madrid to New Orleans, to all points in between. For a portion of the regular season, Davis threatened to break Wilt Chamberlain’s all-time single-season record for Player Efficiency Rating of 31.82, set in 1962-63. In early December, Davis’ PER stood at an unprecedented 33.67 (by comparison, his PER as a rookie was 21.7, followed by 26.5 in ’13-14). Davis eventually “settled” for an end-of-season PER of 30.8, but that is still the third-best figure of this decade and the eighth-best since the NBA adopted the three-point shot in 1979-80. Of the seven relatively recent players who posted a higher PER than Davis’ 2014-15 number, five of them won MVP in the same season.